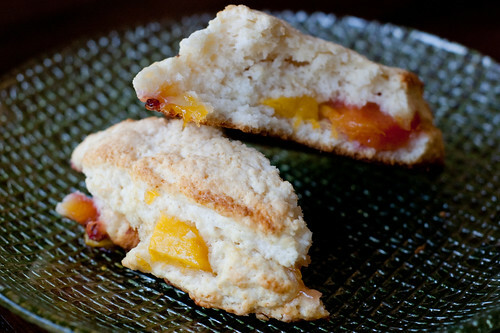 My choice for this week's Project Pastry Queen is Peach Jam Scones. I pored over the cookbook for a few hours, and I went back and forth between a few recipes before finally settling on these. I just can't resist peaches! Both of my sisters were in town for a night, so I made these for breakfast. We all really liked them - our daughters included! 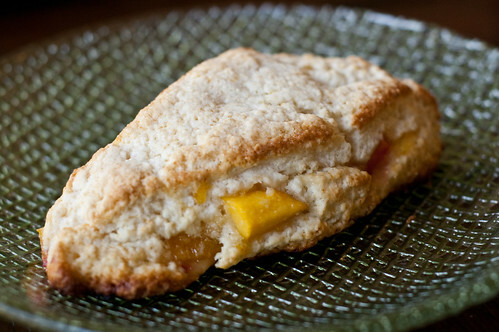 The combination of the jam and fresh peaches make them nice and sweet, and the scone is light and fluffy. I used a trick I learned from Cook's Illustrated and grated the butter, then froze it before adding it to the dry ingredients. It helps the butter become incorporated easier, thereby keeping the butter nice and cold, giving you a flakier scone. I wold recommend working fast though - my scones spread a bit in the oven. I think refrigerating or freezing them briefly would also help. Next week: More peaches! Peach and Cream Cheese Tart coming up! Preheat oven to 425. Grate the butter on the large holes of a grater, and place in the freezer for at least 10-15 minutes. In the bowl of a food processor, combine the flour, 1 cup of sugar, baking powder, and salt for 30 seconds. Add the butter and pulse a few times. With the processor running, slowly pour 1 1/2 cups of the buttermilk through the feed tube. Stop the processor as soon as all the milk has been added. If the dough has formed a ball, remove it onto a floured surface. If not, add more buttermilk, 1 Tablespoon at a time, and pulse until the dough begins to clump up and form a ball. On a lightly floured surface, use your hands to pat the dough into a 1/4-inch rectangle, about 12 by 10 inches. Spread a thin layer of jam lengthwise over half the dough and arrange the peach slices over the jam. Fold the plain dough over the jam-side to make a 12 by 5 inch rectangle with the peaches and jam folded inside. Cut the dough into 4 rectangles, then cut each rectangle diagonally into 2 triangles. Brush each scone with melted butter and sprinkle with the remaining 1/4 cup sugar. Bake on an ungreased cookie sheet for 10 to 15 minutes, until the scones are light golden brown. Serve warm or at room temperature. Lovely! I actually freeze my butter and then grate it for pastry crusts and scones. I'm going to have to try it the other way around! Looks fantastic! I'm like Shawnda - usually freeze & then grate but I wanna try your way! ditto! i want to try this method too next time i make scones! i usually just chill after making the dough but grating & freezing would definitely help! Mmm those look so good and like they have nice crispy edges! This recipe is really great! I somehow managed to get double the amount the recipe said so next time I'm gonna half it. Thanks for this!